(Nanowerk News) In 1839, Louis-Jacques-Mandé Daguerre unveiled one of the world’s first successful photographic mediums: the daguerreotype. The process transformed the human experience by providing a means to capture light and record people, places, and events. The University of Rochester is leading groundbreaking nanotechnology research that explores the extraordinary qualities of this photographic process. A new exhibition in Rush Rhees Library showcases the results of this research, while bridging the gap between the sciences and the humanities. “Researching the Daguerreotype at the University of Rochester: Nanotechnology Meets Local History” features daguerreotypes from the River Campus Libraries’ Department of Rare Books, Special Collections and Preservation; the Rochester Museum and Science Center; and the George Eastman Museum. The exhibition is on view through February 29, 2016 in the Friedlander Lobby of Rush Rhees Library. 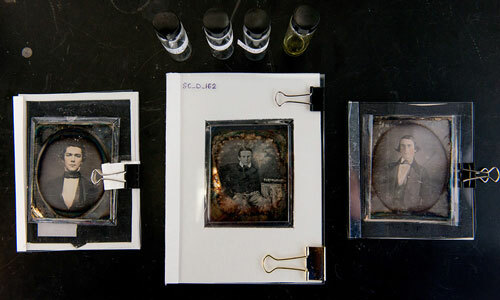 A special presentation about the scientific advances surrounding the daguerreotype and their relationship to cultural preservation will be led by Bigelow, Wiegandt, and Jim Kuhn, assistant dean for Special Collections and Preservation, on December 14 from 7-9 p.m. in the Hawkins-Carlson Room of Rush Rhees Library.